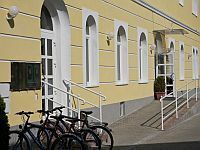 Hotel Lövér is situated in the quietest green area of Sopron. Well-equipped wellness and fitness center offers programmes for visitors searching for recreation, beauty or attempting to loose weight. Swimming pool, sauna, jacuzzi and fitness room are located inside the hotel. The guests may enjoy walking tracks, jogging, tennis courts and excursions to the countryside surrounding the town. 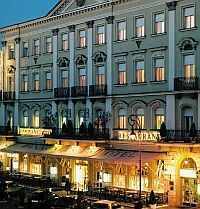 Mandarin Hotel awaits the visitors close to the city centre of Sopron, next to Löverek. 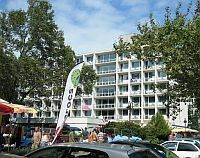 Hotel Mandarin in Sopron offers 28 spacious superior rooms equipped with WiFi Internet access and a wide range of services are available. The non-stop hotel reception service helps you in organizing programs. Come to the town of loyalty, spend the nights in Mandarin Hotel Sopron and discover the region by railway. The freshly renovated 4-star Hotel Novotel Szeged is situated in the most beautiful part of Szeged, directly on the bank of the river Tisza. 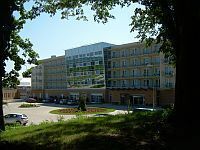 Novotel Szeged offers 136 rooms, all equipped according to the Novotel standards, a Côté Jardin Restaurant and private parking place. Novotel Szeged provides an ideal place for not only the tourists and families, but for businessmen as well. The hotel offers meeting rooms of different size and up-to-date technical equipment.